Are biophilic-designed site office buildings linked to high performing occupants? Click on image to go to the Prezi for the talk. This paper discusses a landmark study underway in Australia incorporating a mixed-methods research design to ascertain the benefits of biophilic design for workers in a site office. A bespoke site design was formulated to include open plan workspace, natural lighting, ventilation, plants, prospect and views, and use of natural office materials. Quantitative data was gathered from pre and post-test Internal Environment Questionnaire (IEQ) scores supported by qualitative data gleaned from in-depth interviews, observations and video analysis of site workers. This longitudinal study spanning over two years will track human-plant interactions in a biophilic designed space, and the concomitant cognitive, social, psychological and physical benefits for workers. Preliminary data indicates a strong positive effect from incorporating green space to ameliorate stress, enhance wellbeing, foster a collaborative work environment and sustain workplace satisfaction. In light of the much discussed ‘disconnect’ from nature, educational moves towards a ‘connect’ with the natural world through ecological ways of experiencing, thinking and knowing are crucial: these are called ecopedagogies. When the arts are incorporated into ecopedagogies, what may this reveal about the nature of communication with the environment? ‘Touched by the Earth’ is a place-based enrichment program for year 7 and 8 gifted and talented students on the South Coast of New South Wales. Dialogue with artists, scientists, historians, and Aboriginal elders on the site was facilitated with students as a means of broadening their own creativity and providing immersion in the place as a multi-modal creative approach through film, dance, poetry, writing, drawing, painting, and music. Our case study approach, conducted through participant observation of the year-long program, examines the impact of creative methods on young adolescent participants. The research addresses the questions: What does it mean to be touched by the earth? How can the Arts amplify a personal relationship with the environment? Data was collected through interviews, student generated material (artifacts, video and photos) and observation notes. Our findings indicate the crucial role of embodied learning through creative methods in place-based pedagogies. It is a powerful vehicle for personal enrichment and facilitates a bridge between the outdoors and the classroom. Photo-blogging with the Facebook Generation: Using Gen Y’s strengths in study abroad reflection. March 21-23 2012, Forum for Education, Denver Colorado. Click on the image to go to the Prezi slides. Web 2.0 technologies create opportunities for distance learning with particular promise for students while they are on international exchange. The current generation of students departing for study abroad is electronically literate or ‘digital natives’, who have thoroughly integrated internet and communication technologies into their daily lives. But their modes of interacting may not be adequate to really gain all that they might learn through study abroad. Many international exchange programs, at the same time, have not kept pace and are missing significant opportunities to reinforce intercultural learning while students are sojourning abroad. This paper reports on qualitative and strategic findings from the project ‘Bringing the Learning Home,’ an Australian Learning and Teaching Council-funded pilot project to develop reflection-based curriculum for improving study abroad outcomes. In particular, we discuss qualitative findings from in-country blogging and reentry workshops using photo elicitation, reflection-based learning, and meta-cognitive teaching strategies, with intercultural skills and professionalization as primary goals. Perhaps most importantly, we found that online tools and visual literacy, with adept instruction and practice, could produce a virtual ‘third space’ where students could better reflect on cultural differences, sharpen their own intercultural skills, and gain the metacognitive skills necessary to become life-long learners from experience. Ecopedagogies: Ways of Connecting with the Natural World through the Arts. Click on the image to go to the lecture slides. In light of the much discussed ‘disconnect’ from Nature, educational moves towards a ‘connect’ with the natural world through ecological ways of experiencing, thinking and knowing are crucial- these are called ecopedagogies. If the arts are incorporated into ecopedagogies, what may this reveal about the nature of communication with the environment? 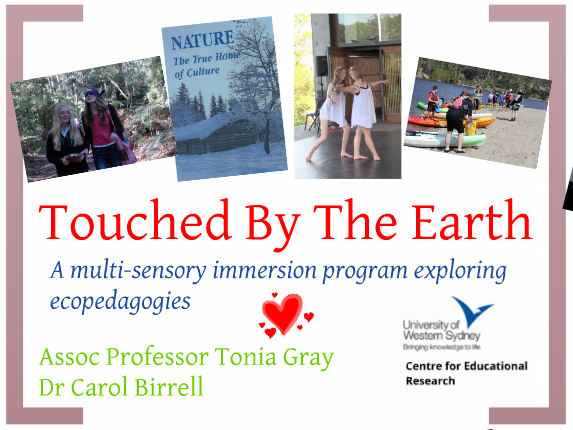 ‘Touched by the Earth’ is a year long part- time enrichment program for year 7/8 gifted and talented students focused on one very special place beside the Shoalhaven River near Nowra, NSW. Bundanon Trust is an arts and education centre gifted by artist Arthur Boyd and his wife Yvonne to the Australian nation. Dialogue across artists, scientists, historians is facilitated with students as a means of broadening their own creativity as well as to explore ideas about how the arts can express relationships with the environment. How are they touched by the earth? Click on the image to go to the Prezi slideshow. As Australia heads into a new era of implementing a National Curriculum, the place of Outdoor Education in Australian schools is under question. In the initial drafts of the National Curriculum, Outdoor Education has been marginalised. The authors argue that Outdoor Education should maintain a strong role, especially as processes of experiential learning are applied across the curriculum. Moreover, Outdoor Education offers distinctive content and learning experiences that would be lost in the current draft framework. This paper considers the role and place of Outdoor Education in the National Curriculum and frames possible considerations, challenges and risks. Wetlands, streams and rivers are key sites for environmental action and education (Somerville and Green, 2012). In this multi-council and school environmental education project 300 young students will be empowered to learn about environmental sustainability through taking action in their local area. Each of the proposed shire councils – Camden City Council, Wollondilly Council and Campbelltown City Council – are partnered with local schools to work with UWS and community and government organisations, to undertake a participatory action research study of place based wetlands education in local primary and high schools (see Attachment 1). This will assist in the preparation of teachers for the introduction of sustainability as a cross-curriculum priority area (ACARA, 2012). The research project will commence with a ‘Love your Lagoons’ Conference and Planning Day at UWS Campbelltown Campus for participating schools, teachers and students and community educators. The morning session will feature specialist presentations/workshops in Aboriginal cultural heritage, biodiversity monitoring (frogs and birds), bush regeneration and weed management, the science of water quality assessment and site interpretation, eco-arts and storytelling. The afternoon session will deliver project management (building ongoing collaboration and partnerships) and media and communication training. It is intended that the planning day will equip participants with the skills and confidence to develop their own plans for a relevant project in relation to wetland education and interpretation. Educational researchers will work with schools to plan, implement and evaluate their program of place-based wetlands learning. Funds of $10k per LGA will be made available for site interpretation and educational resources. There is scope to partner with catchment management authorities to co-fund on ground implementation works so possibly these funds could be doubled for each area. Expanding Universe of Social Ecology, 18-19 April, 2013. Based on the premise that parents have a role to play in the impact upon their child’s aspirations, this paper identifies how parental influence shapes ‘chasing the right school’ within a low socio-economic region. Data was collected from a co-educational comprehensive and partially selective Year 8 high school class (n=18) in the STAR project. Parents of the students participated in the semi-structured focus group interviews at the school. A qualitative analysis of the interviews conveyed that parents influence their child’s career choices both intentionally and inadvertently. The paper concludes that the aspirational trajectories of parents play an equally important role in the formative career choices of students and parents innate drive to ‘find the right school’ is an integral component in their child’s education. Click on slide to go to the Prezi slideshow.